I’m up this week and I’m sharing some of my fave travel pieces! 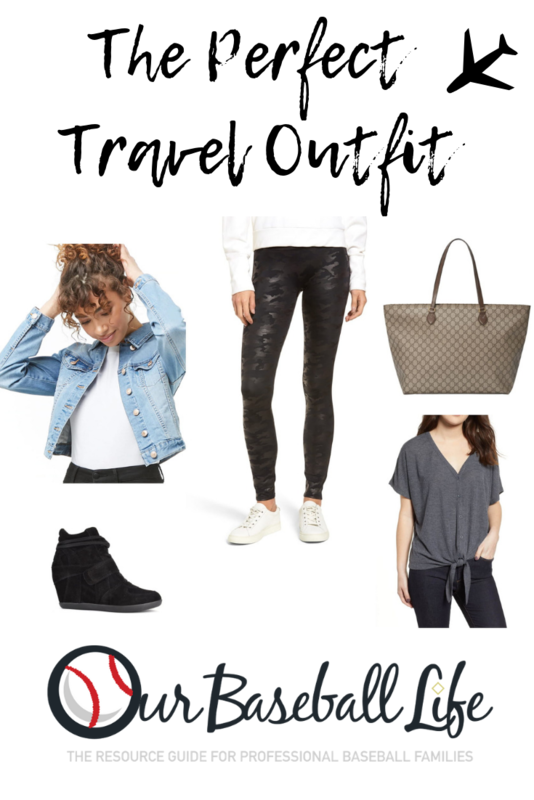 I want to be comfortable when traveling, but also look somewhat put together. You never know who you will run into! Like that one time Bethany Frankel sat in front of me on a flight to NYC lol. I have become obsessed with everything SPANX! I also have the moto style and camo leggings. They can be dressed up or down. Super comfy and keeps you tight and light! I grabbed this cropped jean jacket during Spring Training at the Brooke and Arrow Boutique. Owned by fellow baseball wife, Brooke Nix. I have worn it with everything! Its softer and thinner than most jean jackets which is great for warmer weather and I love the distressed details! So soft and comes in so many colors! Very popular on all the fashion blogs lately! I couldn’t live without a great tote for traveling, they can hold everything! And we are usually the ones holding everything for everybody, am I right? Gotta have a great tote to carry it all! I was so on the fence about the wedge sneaker trend, but Im now on board! Perfect for travel, comfortable and stylish! We would love to hear what some of your travel favorites are! Leave a comment or hit us up on Instagram. Lory Ankiel is the founder of The Athlete's Guide, LLC and creator of “OurBaseballLife.com,” a resource website for professional baseball players and their families. OBL is a resource website that provides information on each MLB city to help families when a player is traded or signs with a new team. The Athlete's Guide is expanding to include families of all the major sports including the NFL, NBA, MLS, PGA and the NHL. Lory is Mom to two young boys, Declan and Ryker and is married to former MLB star, Rick Ankiel.